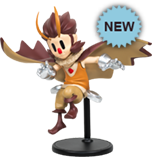 Owlboy is an award-winning platform adventure game, telling the story of Otus and his friends! Fly around the vast colorful skies of a world full of mysteries and history. OUT NOW on Steam, GOG, Humble Store and Nintendo Switch! Coming to Xbox One and PS4 - April 10th 2018. A fast-paced shooting game where you play as Savant as he reconquers his tower. Unlock powerful upgrades as you plow your way through myriads of enemies. A chaotic multiplayer game where you try to knock other vikings off their trampolines in order to win. Announcement coming soon! Follow the development of all of our projects at our development blog.